One of the most important historical sites of the Eternal City is the famous Mausoleum of Hadrian or Castel Sant’Angelo as it is known in Italian. It is located at the equally worthwhile Bridge Ponte Sant’Angelo near St Peter’s Basilica and St Peter’s Square. The Castel was originally built as a mausoleum for the Emperor Hadrian and his successor in the year 130 AD. In later years the building was then used as a fortress, castle and prison as from the outset it had been built as a very solid tower-like building with thick walls and relatively small windows. The building received the name ‘Castel Sant’Angelo’ from legend which holds that in the year 590 Pope Gregory the Great had a vision of Archangel Michael sheathing his sword. As the plague was raging through the city the vision was interpreted as a sign to mark the end of the disease – and this was then actually the case. From then on the former Mausoleum of Hadrian was called ‘Castel Sant’Angelo’ and even today a statue of an angel with a drawn sword stands reminiscent of that vision. Over the centuries the Castel served many different functions and purposes. The most famous prisoner to be imprisoned here was the famous scientist Galileo Galili. Today obviously there are no longer any incarcerations here; on the contrary visitors are more than welcome. The Castel is now a museum and houses an important collection of paintings with works by Italian artists. In addition an exhibition of historical weapons can also be seen. A narrow staircase leads to a viewing platform just beneath the bronze statue of the angel. From here one has a magnificent panoramic view over the neighbouring St Peter’s Basilica and Square which one can enjoy in peace with a coffee and Italian specialties in the café located there. The original angel – a marble statue can be visited in the courtyard of the Castel. 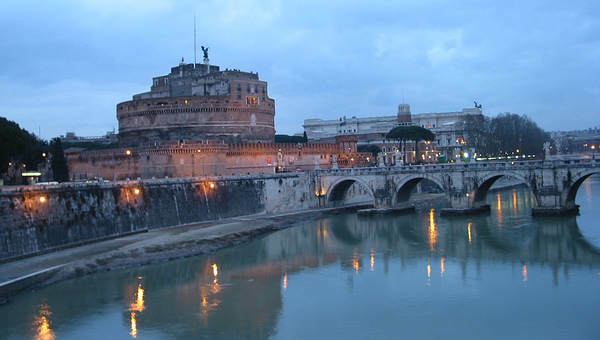 The Castel Sant’Angelo can also be easily reached using Rome’s public transport. One uses the metro - Line ‘A’ alighting at the station ‘Ottaviano’ or one uses the bus – routes 40 or 81, alighting at the stop ‘San Pietro’. The Castel is open daily from 9:00am -20.00- last entry is at 19 hours.